The potential for secular stagnation has been a consistent theme of this blog; in other words, we should entertain the idea of slow (or even zero growth) as a possible norm–and plan our lives so that we fully recognise this risk. Meanwhile, the discussion of permanently slower growth has migrated from ‘crankdom’ to mainstream in five short years, and now even the IMF is humming the same tune. 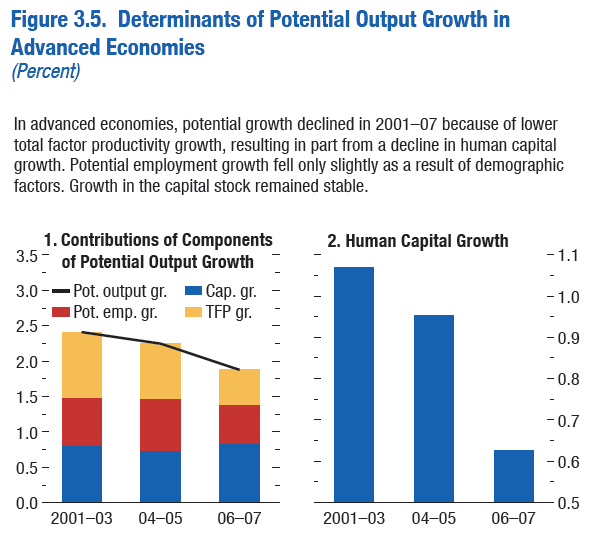 As the above chart shows, potential output growth can be divided into three components: 1) employment growth (more people or longer hours), 2) capital growth (more machines and computers) or 3) total factor productivity (better educated people plus innovation). The big decline was in the last category, which flies in the face of all the breathless cornucopian stories we here: tales of technology abolishing every human ill or want. The UK is in the midst of a productivity panic. The country has exhibited a solid economic recovery measured in terms of GDP, but not one in terms of being able to do more with less. In short, the country is pumping out a larger amount of stuff and services because a) more people are working and b) those who are working are putting in longer hours. 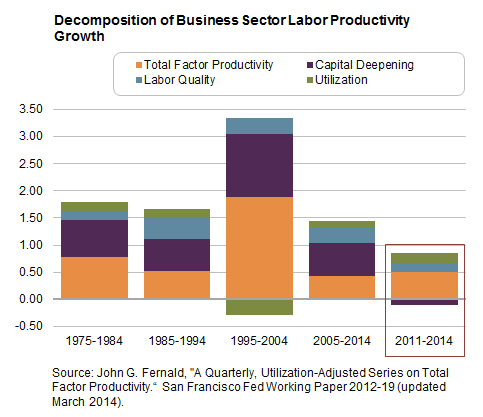 The US appears to be productivity-challenged as well. And productivity is the thing that is supposed to make us rich (sort of). What is going on? Well, we could surmise that we are suffering from the early symptoms of diminishing returns to technology, an idea advanced by the growth economist Robert Gordon (see here). The one and only public debate between the leaders of seven UK political parties took place tonight ahead of the UK election May 7. Key topics were 1) austerity, the budget deficit and debt, 2) the NHS, 3) immigration and 4) education and intergenerational inequality. These are all big issues but hardly new. Dubbed the ‘nudge unit’ in a hat tip to the book by Thaler and Sunstein, this team has taken the idea of choice architecture into the heart of government. As a result, we have seen such policies as pension provision where your choice is to opt out rather than opt in–so the lazy amongst us create pension savings by default. The nudge unit comes about from the explicit recognition the humans are not rationale calculating machines as they are portrayed in post-war economics and that frequently ‘wantability’ is different from decision-making that maximizes our well-being (see my post here). The Office for National Statistics (ONS) introduced its Measuring National Well-being (MNW) programme in 2010. We now have four questions included in the well-being survey that broadly relate to the three main ideas of happiness–life satisfaction, leading a meaningful life and feelings. As this data set builds, it will give policy-makers a far better idea as to whether what they do makes people happier (click for larger image on the chart below).